Cast: Geraldine Chaplin, José Luis López Vázquez, Alfredo Mayo. Synopsis: Julián's (López Vázquez) childhood friend Pablo (Mayo) returns to their hometown with his new wife, Elena (a blonde Chaplin). 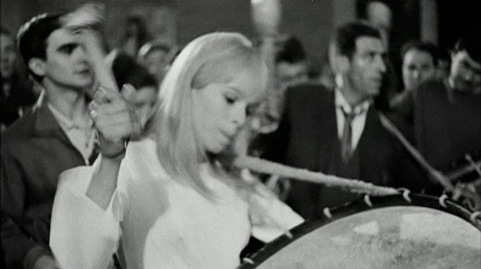 Julián becomes obsessed with Elena, who reminds him of a woman he saw beating a drum during the famous Holy Week ritual in Calanda (also Chaplin). Although rebuffed by Elena, Julián continues his pursuit while simultaneously remodelling his assistant, Ana (a brunette Chaplin), in her image. 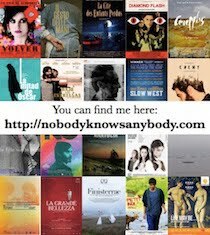 As I've mentioned previously, part of my reason for doing the challenge is that I've seen very few of Saura's films (mainly because of their lack of availability in subtitled form -none of the films I've covered so far have been subtitled), but his career also covers eras of Spanish cinema that I'm unfamiliar with, so I'm hoping that this will broaden my field of reference. What's funny about this is when, watching a film you know next to nothing about, you suddenly see a links to another (more recent) filmmaker. Peppermint frappé is dedicated to Luis Buñuel (who Saura considered a mentor) and there is a lot of Buñuelian sexual fetishising going on -apparently there are many parallels with Buñuel's El (1953), but I haven't had time to watch that film before writing this. But the director who most sprang to mind from the opening credits (Julián assiduously cutting out images from women's fashion magazines and pasting them into a scrapbook) onwards was Almodóvar. Except, of course, Pedro came along more than a decade later. Obviously Buñuel also had a strong influence on Almodóvar, but the central conceit of Peppermint frappé -a man goes slightly mad through jealousy and sexual obsession, and attempts to mould one woman into the image of another, before moving on to murder- and the way in which the women are effectively reduced to the accoutrements of femininity (false eyelashes, lipstick, lace stockings), just struck me as being particularly Almodóvarian and certainly not that far away from some of the films he has made (I had a moment of thinking that La piel que habito is set in the same locale as Peppermint frappé, but it isn't). I guess I wasn't expecting to see any connections between Saura and Almodóvar because they've always seemed to me to be very different filmmakers in both style and content, but it would appear that their common influences allow for some crossover. 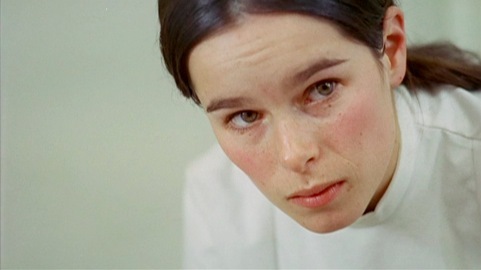 For me, the main element of interest in Peppermint frappé was seeing Geraldine Chaplin play three characters within the same narrative - the woman in Calanda (Buñuel's native town and somewhere Saura visited with him (D'Lugo 1991: 69)) who made such a powerful impression on Julián is only seen in a very brief flashback (although she is 'performed' by both Elena and Ana, in different contexts), but Elena and Ana are clearly differentiated in terms of personality, appearance, and Chaplin's performance(s). If I come back to the film later in the year, I think that would be the aspect I look at in a bit more detail - although if I get around to watching El, then that may be another angle to take. Peppermint frappé is said to form a trilogy of sorts with Saura's next two films - Stress-es-tres-tres / Stress is Three Three (1968) and La madriguera / Honeycomb (1969) (both of which also star Geraldine Chaplin) - but neither of them are available in any format, so the next post will jump forward to the 1970s and El jardin de las delicias / The Garden of Delights.